I tried to do some presses afterward but felt dizzy and uncoordinated so I quit at that point. I hope it's just an off day and I'm not getting sick since I signed up for a 6 hour mountain bike race tomorrow! I'm resting up now. As for my diet and eating habits this week, I can't say I've been very good. I'm somewhere in the middle since I indulged in some chocolate ganache tart and sacrificed my healthy lunch for some nasty biscuits at Bojangles (it was a work thing but that isn't a great excuse). I discovered that the steak biscuit at Bojangles was edible and that the egg & cheese biscuit was nasty. I still ate both of them though and that comes out to 1100 calories! My daily recommended calorie allowance is about 1500-1700 calories so I went a little overboard today. 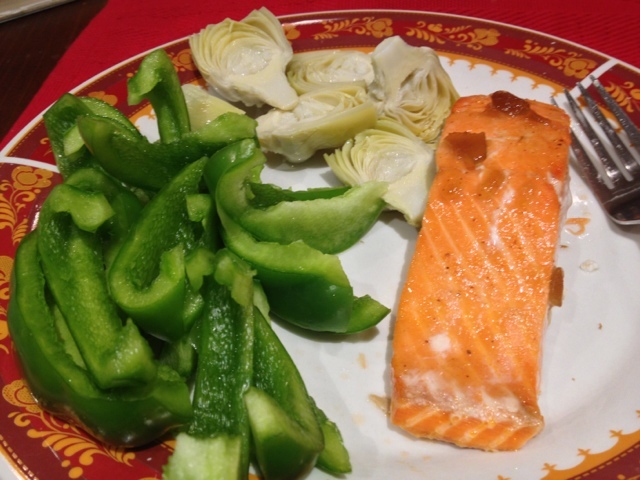 Yesterday was better when I had salmon with artichoke hearts and bell peppers. I have realized that keeping a regular routine of eating food I prepare at home guarantees better success, I'm just not very good at keeping on track when I eat out. And if I do eat out, I have to exercise pretty hard the same day to just maintain an even balance (but it doesn't seem to matter how much I exercise, I don't get a free pass to eat whatever I want).